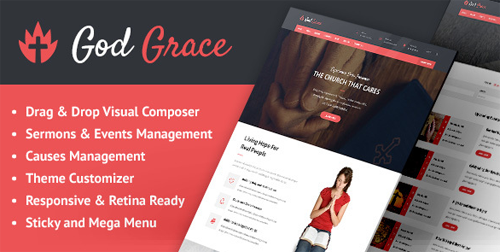 Are you looking for the best WordPress themes for churches? The perfect theme can turn your church’s website into a follower-generating machine. In this article, we’ll share the 20 best church themes for WordPress. All of them are responsive, so they’ll look perfect on any device. If you want to start a website that includes innovative features, like parallax-inspired scrolling on the homepage, then Maranatha is a great theme to use. You can use a still image or a video as your homepage background to entice new followers to your flock. And your most important pages will always be a mere click away thanks to the sticky menu that “sticks” to the top of the screen, even as your site’s visitors scroll downward. With Maranatha, you can upload your sermons as audio or video files, or even type out the transcriptions as text posts for your blog. This theme also offers beautiful layout options for your About page and Events calendar. Get Started with Maranatha Today! Brought to you by the fine folks at StudioPress, Outreach Pro utilizes their powerful Genesis framework. If you need to convey a lot of information on your website, this is a great theme to pick. There are several pre-made templates to get your site up-and-running in a hurry. And the theme’s customizer allows you to alter the color scheme to match your church’s brand. With 12 widget areas and a customizable header, you’ll have no trouble tweaking Outreach Pro to look exactly how you need it to. Get Started with Outreach Pro Today! Clean, elegant, and softly pink like a Heavenly sunrise. The Salvation theme is perfect for a number of denominations to get their faith-based messages across in a beautiful way. This theme comes with an event management system and a tasteful donation form that integrates with PayPal. Plus, there are several custom widgets you can use to make the most of your website. Get Started with Salvation Today! Don’t let the name fool you! Although “exodus” typically means a mass departure of people, the last thing your site visitors will want to do when they land on your webpage is leave. The Exodus theme will have believers rushing to your flock. Exodus is easily customizable, and uses a live preview function so that you can view your changes to its colors and fonts in real time. This theme includes pages already built-in for Sermons, Events, Locations, and Staff Profiles. We were especially impressed with the Sermons page as it allows you to upload your messages as text, audio, or video files. Get Started with Exodus Today! 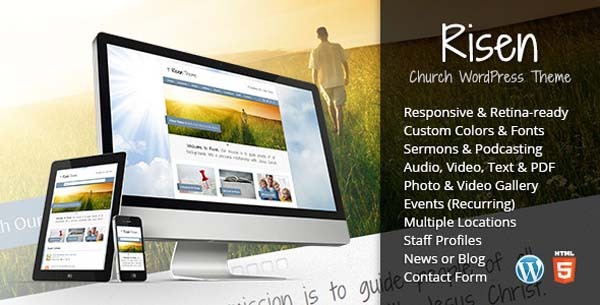 Bring fresh live to your church’s website with the Resurrect theme! Choose from a light or dark color scheme, and then customize it to your heart’s content. Resurrect comes with several fonts to choose from and the option to upload a custom logo image. It’s also optimized for high-resolution screens, so your images will look crisp on every device. Get Started with Resurrect Today! One Church features 12 different color schemes to choose from. Don’t like any of the colors provided? Not a problem. They also include a custom color picker so you can choose your own! You can publish your sermons in video, audio, or text formats. And the page categories lets you list them by speaker, topic, or series. One Church is also integrated with Adobe Typekit so you’ll have plenty of font options to choose from to make your site stand out from the crowd. Get Started with One Church Today! With its flexible homepage layout, Prayer allows you to add multiple widgets to your front page to create a truly unique layout. The featured gallery slider is a nice touch as well. If your church is active on social media, you’ll be very pleased with its social networking widget. You can connect your site to Instagram, Twitter, and more! Just as prayers come in many different forms, the Prayer theme comes in many different colors. Best of all? You can use a different color scheme for each page you create! Get Started with Prayer Today! If your church has a podcast, then Kerygma is the theme for you. It was made specifically to feature podcasts in audio or video form. It comes bundled with SiteOrigin, one of the best website page builder plugins on the market. You can use its drag and drop functionality to quickly and easily customize your site any way you like. With the option to upload your own logo, change the theme’s color scheme, and make use of over 600 Google fonts, you’ll be able to match your website to your brand with ease. Get Started with Kerygma Today! 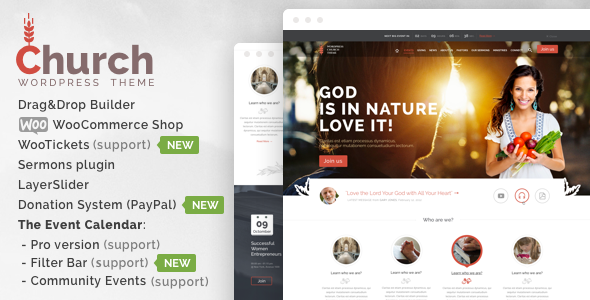 This theme will make your website as epic as your church itself! Choose from a light or dark color scheme and get ready to impress. Another podcast-focused theme, Epic allows you to upload audio and video feeds for iTunes and RSS subscriptions. And the categories feature lets you archive each of your speakers separately. We liked that the navigation bar could be placed inside your logo or directly above it. Get Started with Epic Today! Fully-integrated with WPBakery, God Grace is quick and easy to set up via an intuitive drag and drop builder. But this is just one of many reasons it made it onto our list of the best WordPress Church themes. God Grace guarantees full support from their team should you ever get stuck while building your website. They pride themselves on being fast and reliable. Share sermons, promote events, and accept donations through this incredible theme. You can even sell products, like church literature or branded clothing, thanks to its WooCommerce integration. Get Started with God Grace Today! Equipped with WPBakery and Revolution Slider, Blessing lives up to its name. You’ll certainly feel blessed by this easy-to-use church theme. The touch and swipe image carousel is perfect if you expect to have a lot of mobile or touchscreen visitors. 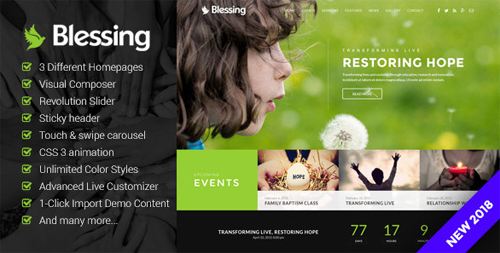 Get Started with Blessing Today! 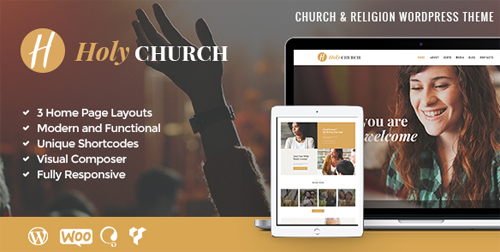 Perfect for churches and prayer groups, Holy Church comes loaded with everything you’ll need to make your website a success. This theme has a powerful blog which is great for sharing news updates with your followers. It comes with Events Calendar for showcasing upcoming events within your organization. It’s also compatible with WPBakery for ease-of-use and WooCommerce so you can sell things from your gift shop online. Get Started with Holy Church Today! Credo is perfect for churches of all denominations. It also works extremely well for charities and nonprofits. Archive your sermons, share photos and videos, get eyes on your upcoming events, and tell the world about your church! Get Started with Credo Today! 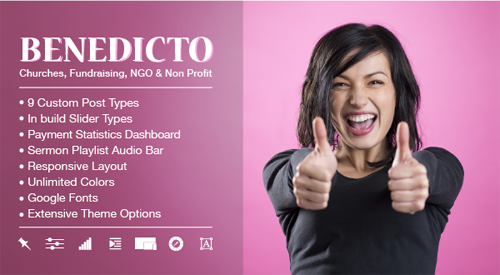 Translation-ready with plenty of customization options, Charitize is perfect for your church or charity organization. They recommend using the Jetpack plugin with this theme. If you happen to love Jetpack already, then this is a great choice! Get Started with Charitize Today! This free WordPress theme is very lightweight, making loading speed a priority. It’s also optimized for SEO so that you’ll rise through Google’s ranks. It supports WooCommerce so, if you have an online store, you’ll be good to go. We also enjoyed the Instagram widget, which is perfect if you already have a social media presence. Get Started with TheMoments Today! Do you have a church? Does your church host events? Then Church and Events is the theme for you. This theme supports The Event Calendar Pro, Filter Bar, WooTickets, and Community Events plugins which makes it absolutely perfect for churches that host several events throughout the year. It also has 10 header options and 20 footer options, giving you plenty of customization options. Get Started with Church and Events Today! With its newsletter subscription widget, WP-Church was designed to help you skyrocket your email subscribers. And with its custom-built sermon gallery and eye-catching slideshow, you’ll be getting plenty of engagement on your webpage. With 6 custom colors to choose from and 8 custom widget areas, you’ll be able to make WP-Church look exactly how you want it to. 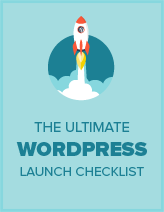 Get Started with WP-Church Today! Give your religious movement a modern look with the Dunamis theme. Dunamis comes with a demo site that’s easy to install for quick website setup. Or, if you prefer, you can use its built-in drag and drop page builder to design your website from scratch. We were especially impressed with its donation management system. Accept donations on your website and then keep track of them with ease right from your admin dashboard! Get Started with Dunamis Today! Benedicto features 9 custom page layouts, 35 custom widgets, and is completely translation-ready. If you’re looking to attract a diverse following, this is a fantastic choice. With unlimited color choices and font types, Benedicto can effortlessly conform to your brand. Plus, you can embed any sermons you’ve uploaded on Soundcloud.com! Get Started with Benedicto Today! Rise to new heights with the Risen theme! It has everything you could ever want in a WordPress church theme: a sermon archive, an events page, a photo gallery, a news page, and more. This theme is incredibly versatile and works well for churches of all denominations, charity groups, and nonprofit organizations. Get Started with Risen Today! We hope this article helped you discover the best WordPress themes for churches. If you liked this post, you might also enjoy our easy step-by-step tutorial on how to build a donation form in WordPress.